I have wonderful news! (for me mostly), I have defeated a major white whale of mine. A bug that has annoyed me since ages ago, but has become a personal vendetta just recently. Have you ever noticed that problem statements in the topcoder statistics site sometimes have way more line breaks than in the arena? 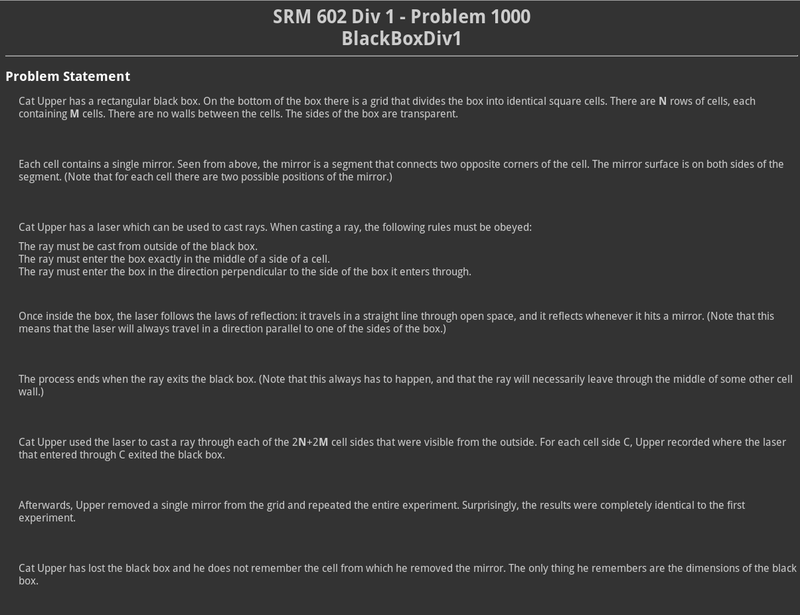 Try the SRM 602 div1 hard BlackBoxDiv1 , for example. This is how it looks like in the statistics: http://community.topcoder.com/stat?c=problem_statement&pm=12923. Now try it in the arena, it is much better there. 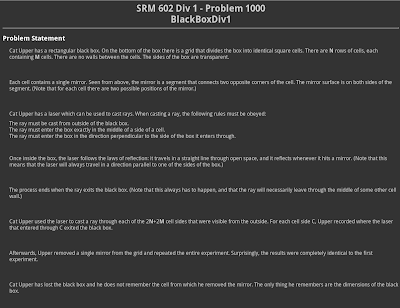 It has become a bigger issue when the Greed plugin added problem statement support. Its ability to automatically generating problem statement HTML was something I never thought I needed, until I started using it. It is so useful for editorials to be able to read statements without having to navigate topcoder&apos;s site! It also allows much control in the way the statement looks, making things easier on your eyes. 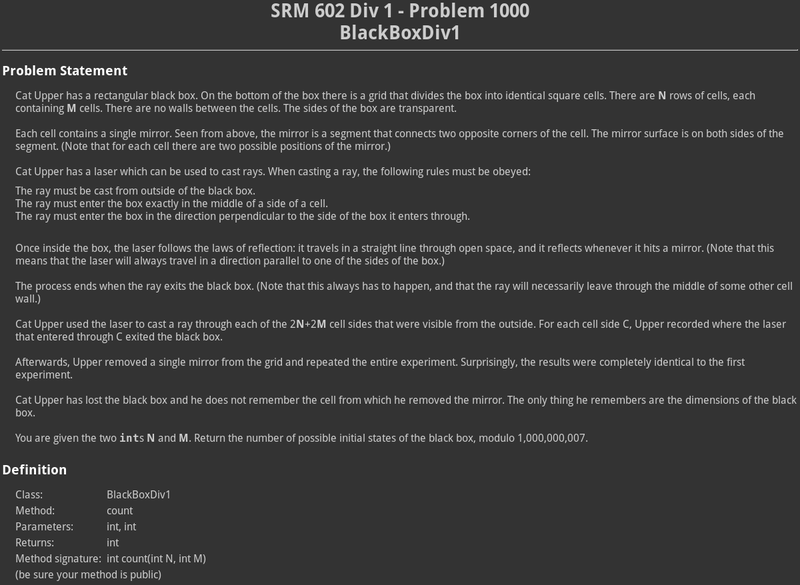 But of course, the same bug that happens in the statistics problem statements happened in Greed&apos;s problem statements. It is a very strange bug that happens only in some problem statements (strangely (Now I know it was not so strange), it always happens with *my* problems). So for long I was clueless as to what causes it or how to fix it. I even tried to write a thread about it asking for help from anyone who could decode this mystery. Tonight, I was messing with some other bits of the problem statement, when I noticed something funny about how firefox shows source code... 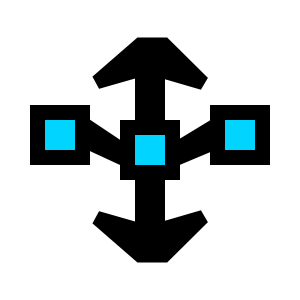 It painted some </br> closing tags red. This is something I never bothered to pay attention to before, but tonight it finally hit me: Topcoder statements seem to use XHTML. I know at least that some XML is used in topcoder. Usually if you use the <br> (line break) tag, the problem statement editor would convert it to <br></br> (and thus close the tag). However, when you use HTML , browsers consider a </br> tag as nonsense that probably means <br>... This causes them to add an extra line break :). 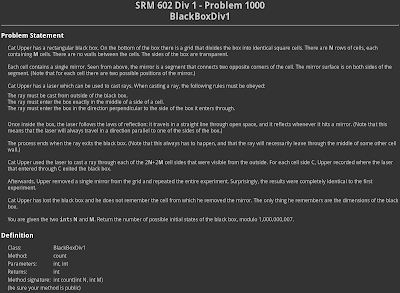 So, just rushed to Greed&apos;s source code and added a tweak to replace <br></br> patterns with <br/>. Build the plugin , test, and voila! I know what you are wondering: Does this mean that Greed is better at generating problem statements than TopCoder&apos;s own site? - The answer is yes.